Tintsmart are a local company with a fully equipped workshop. All our Tinters are extremely experienced and have a wide portfolio ranging from one way mirrors on a few of the very popular reality TV programmes, to tinting a formula 1 racing drivers private car. For Vehicle Tinting we have Tinting Technicians with over 10 years experience in the car industry giving an all round knowledge base on what is best for you and your car. We are well known for our friendly and professional approach when it comes to tinting our customer’s homes, commercial buildings and vehicles. We work with private customers as well as main dealers and our clients come back to us time after time as we are able to provide the most professional ‘factory look’ finish at the most competitive price you will find – that’s a guarantee! Because we are extremely confident of our ability to perform a great installation and we understand that you may have difficulty deciding who to choose, so we offer a lifetime guarantee for the original owner. 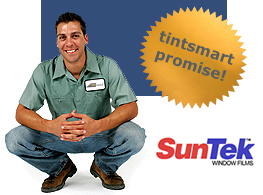 Use tintsmart for all your window tinting needs.